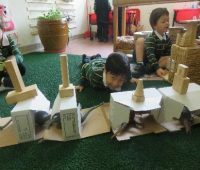 As we near the end of our first term we are really starting to explore our environment with lots of wonderment and enthusiasm. 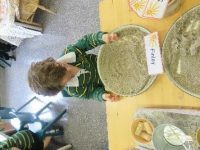 It is lovely to see the children experimenting and exploring the materials in the classroom and engaging with each other. Thank you to all the lovely parents who took the time to come and meet with me over the last few weeks. 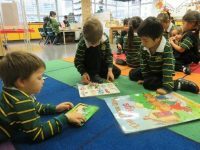 Our parent meetings are a great way to get to know each other and to find out more about your child. I was able to connect more and develop a greater understanding of your child through our discussions. As part of the Australian National Day of Action Against Bullying and Violence we had a special focus on Kindness. 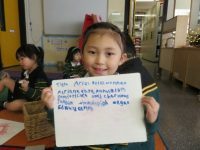 Through stories and songs, we learnt about what kindness looks like, what it feels like when we do kind things and how to be kind in our very busy classroom. Last Friday we wore our orange kindness stickers with pride and sang our Try a Little Kindness song with lots of enthusiasm! 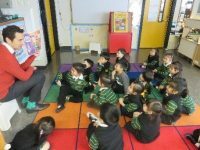 As a special treat we also had Mr Kean come in and read us a story, Can I Join Your Club? 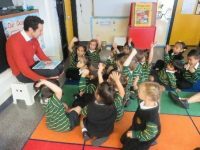 where we were able to tell him all about what it is to be kind in Reception. Even though the focus day is over we will continue to promote kindness and model social language in Reception. We have been busy sailing the high seas and going on adventures in our cardboard boats! 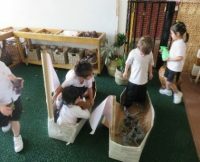 Some old boxes were placed outside, and they were the perfect shape for a boat. We eventually added a sail and reinforced it with tape, and it is yet to be sunk! The children have collected shells and sticks, added dinosaurs and foam bricks, stopped for picnics and fished. 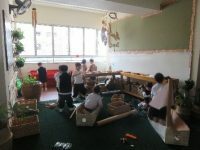 We have used the tools to build it up and fix the holes, with lots of sawing and drilling. We have had so many adventures. Sometimes it is the simplest of things that bring so much learning and joy. 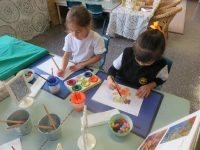 Through this experience we have had to negotiate with others, collaborate and engage by using lots of language and to use our imagination. 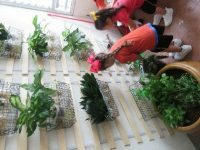 Outside of our classroom a vertical garden and herb garden have been added. To make sure our plants grow we have been using spray bottles to squirt them with water and sometimes anything that is close by. 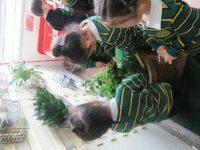 We have been looking at the herb garden, using our senses to smell and touch the different herbs. Some are deliciously minty and others we are not too sure of. 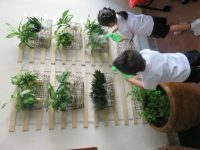 We are beginning to make connections to living things and what we need to do to keep them alive. 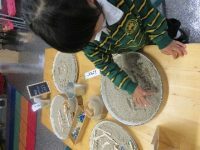 We have been exploring the wet sand, making patterns and writing our name in the sand. The sand is crunchy and sticky when we put our hands in it. Writing our name in the sand and making patterns will help us with our reading and writing later. 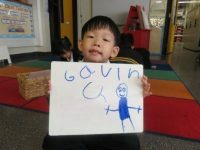 We have also used the white boards to make marks and write letters, this is an easy way to ‘write’ as we also like rubbing it out! 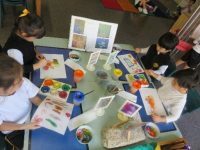 In the art area we have been experimenting with water colours and using different size brushes to paint and make marks. Some of our work is hanging in the classroom, please come and see how amazing we are. We have also been looking at our numbers and exploring size and length. 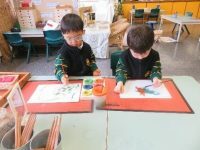 We have used different activities to explore number through sequencing, matching and writing. 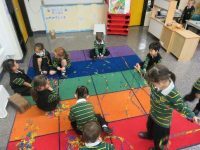 Several children used the links to see how long they could make it and managed to connect the links the whole length of the classroom! Some children used measuring tape to measure the different things in our classroom, we used clip boards to record our findings. We have also been exploring and using math language such as fourth, longest, tallest, bigger when we have been exploring our environment. 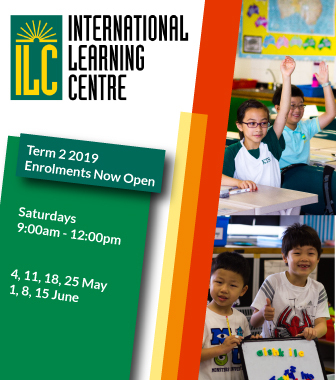 Over the next two weeks we will focus on making connections with our school environment. We will be visiting Mr Hemphill’s office on the 9F, having a look at the roof top garden, seeing where Nurse Karla is if we get sick, and visiting Mrs Moore and Mr Kean in their office on the 3F.